Product prices and availability are accurate as of 2019-04-23 03:56:43 UTC and are subject to change. Any price and availability information displayed on http://www.amazon.co.uk/ at the time of purchase will apply to the purchase of this product. With so many drones & accessories available today, it is great to have a manufacturer you can recognise. The New Version- Syma S107G 3-Channel Infrared Remote Controlled RC Helicopter with Gyroscopic Stability Control, Special Indoor Flight Design, 3 Ways Precision Controller, Adjustable Trim Control, Build-in Gyro Technology, 3D Full Function, Double Protection is certainly that and will be a perfect acquisition. For this great price, the New Version- Syma S107G 3-Channel Infrared Remote Controlled RC Helicopter with Gyroscopic Stability Control, Special Indoor Flight Design, 3 Ways Precision Controller, Adjustable Trim Control, Build-in Gyro Technology, 3D Full Function, Double Protection comes highly recommended and is always a regular choice amongst many people who visit our site. Syma have included some excellent touches and this means great great bargain. Syma 3 stations mini metal R/C helicopter with gyro is just one of the globe's newest, smallest & lightest R/C helicopters! Geared up with newest Gyroscope technology the control you possess through this helicopter boggles the mind. At approx. 7.5 in long, it easily suits the hand of your palm and is actually entirely practical. 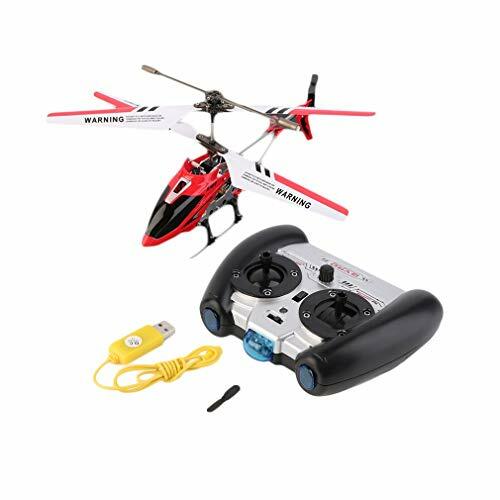 The helicopter asks for straight either coming from the USB cable or coming from the controller which makes use of 6xAA electric batteries (certainly not included) and has a full-function slick control for the best air travel. 1. Amazing Technology in the hand of your palm! 2. Syma's Newest Model S107G 3CH Gyro RTF Metal RC Helicopter. 3. No Assembly required, Ready To Fly! 5. Recharging takes place by means of the transmitter or USB cable. 6. A lightweight Lithium Polymer battery. 7. Span: Approx. 7.5 ins. Width: Approx. 7.5 ins (with primary blades). 8. Suited for indoor soaring merely. 9. Suited for ages 14+. 10. Trip Range: Approx. 30ft. 11. ROHS, ASTM, FCC and CE Approval.